Charles emigrated to Ostend in 1730 and was helped by a close network of Irish merchant families involved in the butter, hide and general trading. There were families with Youghal connections such as the Rays and Lucans and from Cork the Roches, Rays and Coppingers. These emigre Cork families were from an old English background except the Coppingers who were believed to be of Viking origin. These families had been displaced from the prominence they enjoyed as Cork merchants by the ‘new English’ and were seeking new opportunities. He was initially involved in provisioning ships with butter and later became involved in the tea trade purchasing teas from the East India Company and managing to export it to England without the inconvenience of paying duty. In this he again was relying on the extensive Irish network. His second marriage was to Mary Coppinger of a family with close Cork links, her brother Thomas was a merchant based in Gothenburg. Over the years his business interests became quite extensive into shipping, grain speculation he rode various mishaps deftly and died on a visit to Cork in 1758. His family continued the business into the next generation. My maternal surname. Hennessey and walsh. 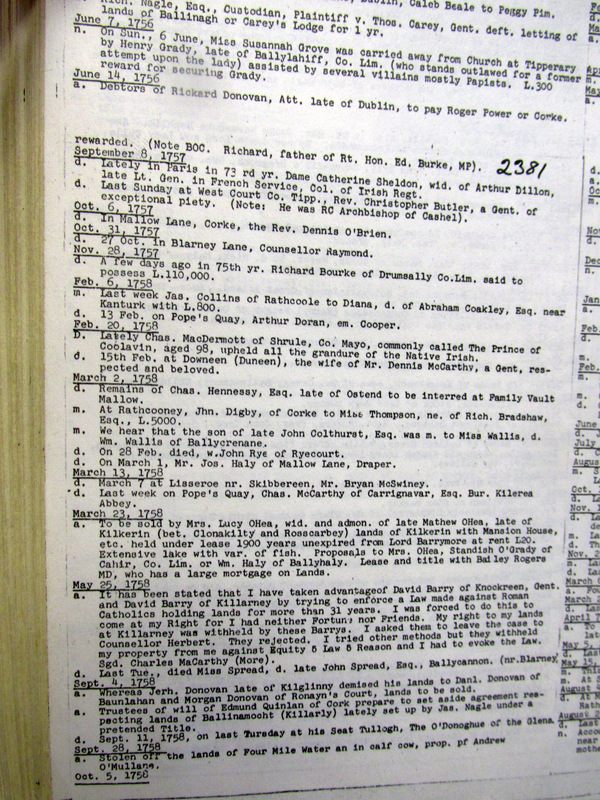 Is there a detail genealogy of the Hennessys in Ireland? I’m particularly interested in the Pope Henessys of Cork. Sir John Pope Hennessys ancestry.